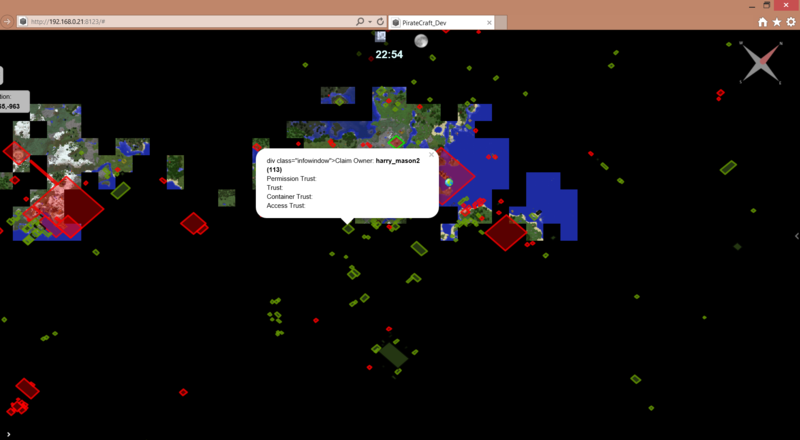 A modification of the original Dynmap-Griefprevention plugin by mikeprimm (http://dev.bukkit.org/bukkit-plugins/dynmap-griefprevention/). What's the difference to the orginal plugin? Nvm, I see you have updated the description. Does this work with Spigot 1.7.9?/1.7.10? I don't know. Need someone to test this and response if it's working or not for other versions. I just enhanced this a bit for my needs on my server (Tekkit Lite) and wanted to share it to others where it might run. If I get some responses about setup/config/version if it is not running I might have a look if I can adapt it. At least I see in MCSTATS that someone from Canada has it installed with Spigot 1.7.9. but that does not mean that it's working. Look, the only thing I've added was to check if the claim owner (who is already in the popup of the original plugin) is absent more than the days specified in the config (just an if clause). I don't see how there could be any memory leak or something. But yes...if there are many claims (>2000) it takes some time to show all of them as I need to check every claim (and owner) and the builders if the claim owner already exceeded the limit of days. Woah calm down! It was only a suggestion, and a good one too! You should submit changes to the main git. Lets see if I can remember the issues I was having. No matter what I tried, I couldn't change the colour of the green claims, they wouldn't update, I tried the x0 method and normal hex codes. There were more issues, but this is all I can remember off the top of my head at present, Getting these ironed out would be fantastic! Which version is that now where you've provided the link to your map? I see claims with my Internet Explorer there but no unused/old claims and the popups do not look like I know them? P.S. : I have an Spigot 1.7.9 server locally running on my Windows Desktop and there everything works fine for me. And if I open my dynmap (link is in the plugin description) with Internet Explorer it also shows all claims as I would expect it, hm (but this is version 1.4.7 Tekkit Lite). I don't know what you've changed but I guess that there is whatever error/typo in it. My map version is using the default Dynmap Griefprevention, I cannot use this version sadly until the bugs are ironed out. Here is my config, but like I said already the username will have to be seperated from username (timeoffline), This stops any external use which is very handy for passing information to other web apps. e.g. 'jahangir13 (14)' needs to be seperated into 'jahangir13' and '(14)'. So a variable for the days this user is absent. Hm. What I am more interested in is: if you just use the plugin as it is 'shipped', is it then working or not? I mean without your changes in the html. I've checked your html and this seems correct to me. So I am wondering what the cause might be that it's not working for you. I do not get enough feedback here to know for whom it's working or not working. I see in mcstats that there are some few servers with version 1.7.9/1.7.10, and for a longer time now. That does not mean that it's working but I expect it is. I got 1 message from a user that his server is running version 1.7.9 and he included a link to his working dynmap. Yes it works on spigot 1.7.10, I thought that was obvious seeing that im reporting problems!! and yes it does work in internet explorer without any HTML edits, But the bundled HTML is a complete mess. Looking inside the inspector window in firefox, it seems as if the allAbsent, ownerAbsent and publicTrusted are hardcoded, Unless all these config settings are supose to be part of ownerstyle? Colours are broken, you cannot change it from the sick coloured green and black border. Seperation of username and days offline are still needed! There's a typo in your config html code, I guess (for the mess in your screenshot). But yes. the colors are hard-coded in case these cannot be found in the config and I guess there is an error somewhere. I will have a look here. For the claim owner a new var %ownerdays% or something will be created so that this can be seperated from the name. For the builders I do not have a good idea as these are in a list/string one after another and you cannot know how many that are for each claim. So this cannot be done via the config with place-holder variables. Claim (W)idth, (H)eight, (S)ize could be included to be used in the config as variables. But when I tried that with my 2300+ claims these operations took already a recognizable amount of time longer than before and moving the map around was getting slower. I could put something like this into the plugin with an option (on/off) to choose in the config. Lovely. Great to see a replacement for this great plugin. Thanks for the extra variables. yes! fantastic, I cant wait to test this out! Finally got around to testing the 1.0 version, and it dosunt show claims, generated a new config so no changes made. It crashes my server after about 60 seconds, heres the console output. Hm, can you send me the config file you've used here?